Thanks to all who participated in our first ever Dunk Tank fundraiser! Without you, we couldn't have done it. Many thanks go to Lion Tara Smith for conceiving, organizing, and executing this fantastic fundraising idea. Thanks also go to Jeff Smith for working in the hot sun all day, and to Larry Glemser for the use of his vehicle to fetch and return the tank. Additional thanks go to local students Joey Harrell and Mary Kate Suhy, who both helped out on very short notice. We need more young adults like them. Thanks also go to Nemath Construction for being our generous sponsor. We also want to thank SmithPrints located in Chalfont for donating T-shirts, graphic designs, and promotional literature. 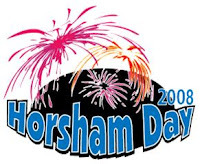 Thanks to all Lions who helped out during Horsham Day 2008. Without fund raising, we can no longer help the community, so all the hours you spent baking in the hot sun were worth it. Extra thanks go to Pam Tuckey for helping us serve ice cream and roast pork under the tent. 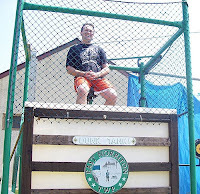 Look elsewhere on this site for Dunk Tank photos. 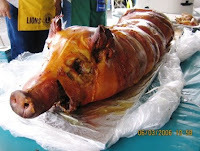 Many thanks go again to Sam Braccia for donating our roast pig. We couldn't have done it without you. Also thanks are due for the Horsham Township Parks and Recreation folks, without whose help we couldn't have pulled this off.